I have just realised, as I write this blog, that it could be a biased review. On my first trip to Italy I stayed with a family in Florence who had a few spare scooters lying around. I hadn’t ridden a scooter before but hey, it was automatic and they said “go for a ride”. Well readers, this began my love affair with motor scooters, in particular the beautiful Italian Vespa. The ability for a 2-wheeled engine to bring you right into the moment and focus your attention on the task at hand and the surroundings, bringing all your senses to life, is something that has to be experienced to fully comprehend. Riding takes total concentration and it clears the mind. When I’m driving a car I listen to the radio, take phone calls, talk to passengers and I’m excluded from the environment. Riding a bike is a fully submersive experience, the smells, the weather, plus that existential and constant battle to stay alive, all adds to the adrenaline rush. It’s way more than getting from A to B, it’s an artform, a sport….an enjoyment. Look at this view overlooking Verona! First stop for the day. So here we were in Verona, Italy having first taken a look around Venice , and with a quick Google I found a tour company called Motoragazzi. 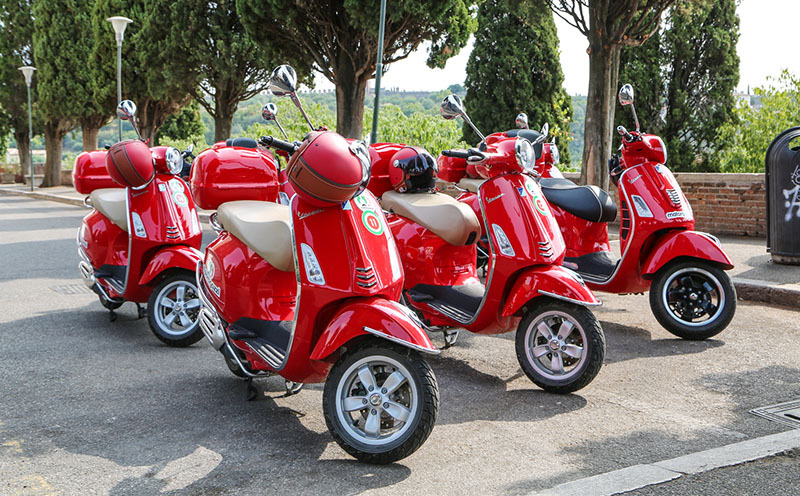 It looked well organised and the red Vespas looked gorgeous, new and so very Italian. Perfect! 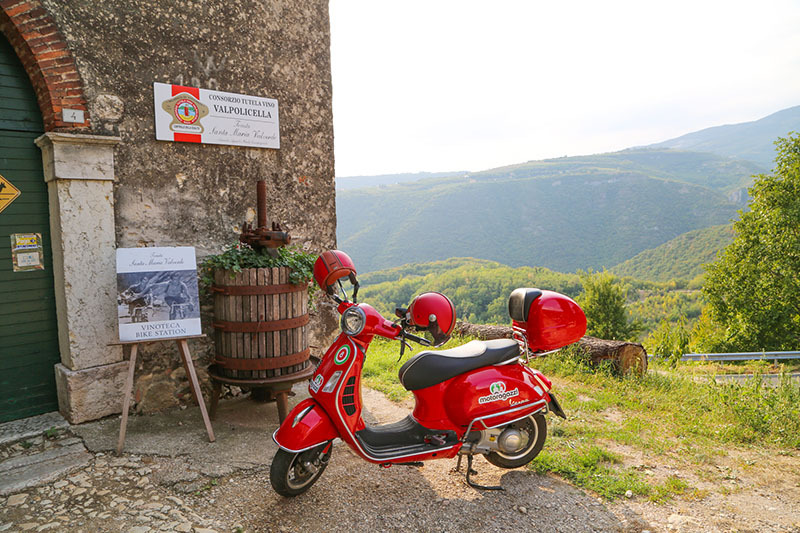 Motoragazzi offer a few self guided Vespa tours but we chose “The Mountain Escape”, which was fully guided and with a team of around 10 others. We started at Motoragazzi HQ about 20 minutes out of Verona, in an area of orchards and grapevines. You can catch a local bus or, like us, you can organise a pick-up for a small fee. Before we set off we met our fellow riders and were given a short briefing and a chance to try our riding skills before we hit the roads. 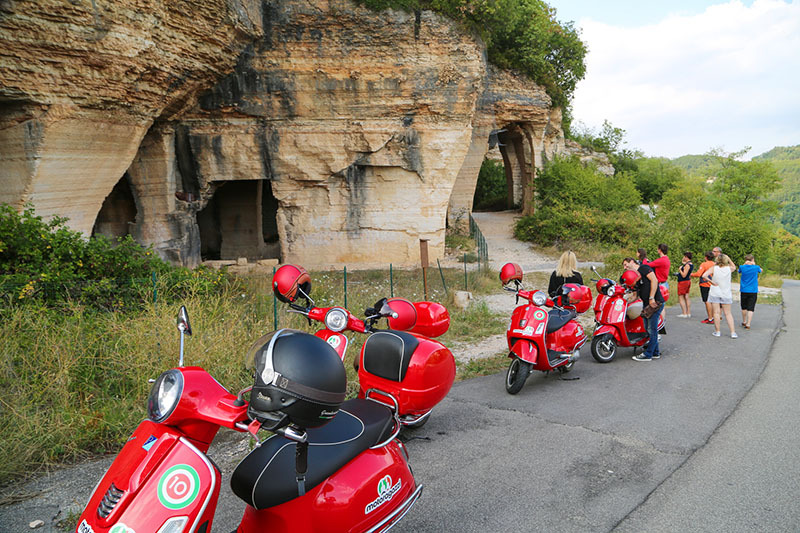 Although we were travelling with 5 other Vespas and 2 tour guides, Motoragazzi had also set up our route, including stops, in a Garmin satellite navigation system which was attached to our bike. Along the route there are points of interest to stop at, but as Andrea explained, he is not a tour guide so he won’t be stopping every 10 minutes to talk about the grape varieties in a particular vinyard. It was all about the ride, and taking in the changing vistas. Of course, the stops were great and being able to sample some of the local cheeses and wines along the way, have a hilltop lunch of local Italian fare and refuel on coffee afterwards in a small town were all part of the experience. Motoragazzi gives you a choice of bikes, the first is a Vespa GTS Super 125 for those without a bike licence and the other is a Vespa GTS Super 300 for those with a licence, which I chose for the tour. Both bikes allow you to comfortably take a pillion passenger and of course all bikes are racing red! So off we went into the hills of Verona, taking mainly back roads with not a lot of traffic. As we started our climb we could feel it getting cooler. The rainforest in the mountains took at least 10 degrees off the hot mid-Summer temperature of Verona, and we were amused to see people taking mattresses out of their cars and laying down on the side of the road – a siesta in the cool mountain air. We were pleasantly surprised at the lack of traffic which helped us to enjoy the road even more. We stopped for coffee, we tasted amazing local cheeses, dodged a few cows wandering on the road and eventually ended up at the top of the mountain where we had the most amazing homemade gnocci and polenta – ever! We could stop wherever took our fancy even though we were in a group, and because of the sat nav we never got lost. They even supply us with an iPhone just in case we had any problems – which we never used. On the way down we stopped at a few interesting sites including a small old Italian winery that had been in the same family for 7 generations. We sampled a great red and chatted with the owner, learning about the history of the area and the winemaking process and having peronal tour of the cellar and admiring the beauty of the rolling vine laden hills. It was a great addition to day. But really, it was all about the ride. The guided route was never taxing on the rider and offered amazing vistas around every corner. We had started out at our Verona accommodation at 9am and ended back at our accommodation at 7pm that evening. It was a full day of happiness. We loved the windy mountain roads, the fresh mountain air and the sense of freedom scooter brings, local tasty delights, and feeling like a romantic Italian couple riding on a bright shiny red Vespa. Grazie Verona and Motoragazzi for a wonderful day! Mark and Kirsten travelled as guests of Motoragazzi.